Welcome to the 34th edition of the Three Rivers Open! The Fort Disc Golf Club is thrilled to host the seventh stop on the 2019 Indiana Summer Series - Saturday July 27th through Sunday July 28th. The biggest change that you will see this year is that the tournament has expanded to a 3-round, 2-day tournament. Saturday competitors will play two eighteen hole rounds at West and East Swinney park. Sunday all players will play one round at Fort Wayne’s newest championship level course - Tillman Park. For Sunday’s round all player’s will be assigned a tee time based off Saturday’s results. The FDGC is excited to showcase Tillman and provide a unique experience for Indiana disc golfers! Over the past five years the City of Fort Wayne has focussed on downtown revitalization, which has resulted in many great restaurants, breweries, etc. We are ecstatic to be partnering with one of those amazing breweries for the 2019 player’s party - Summit City Brewerks! 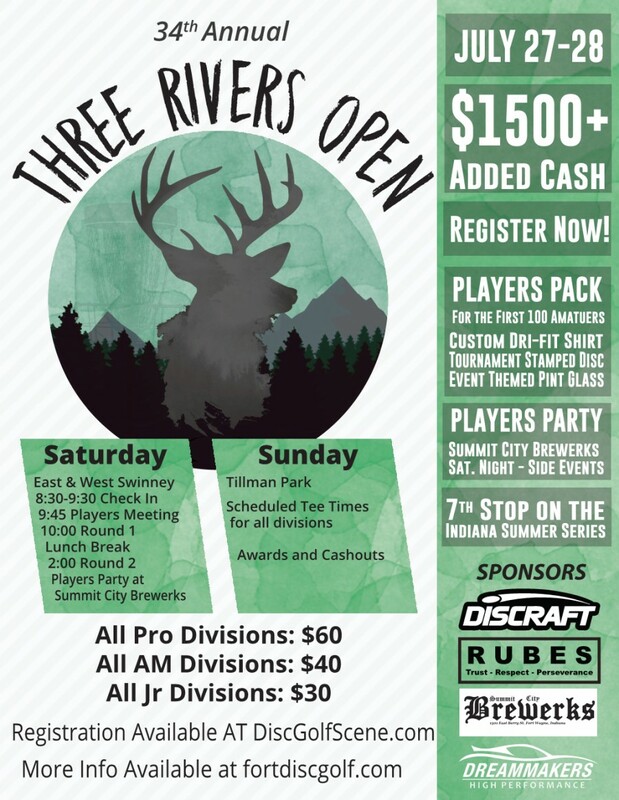 Summit City is opening the doors to all competitors, spectators, family, and friends as well as providing all players with a 2019 Three Rivers Open Pint Glass. Thanks to Summit City for their amazing support. You can support them by stopping in and having a pint or two! Sponsorship efforts are well under way and we are aiming to bring you a high quality experience. There will be $1,000 added cash minimum for the pro divisions and $250 added funny money for amateurs! $4 of the $6 dollars PDGA and Indiana Summer Series fees will be covered for every player. The first 100 amateurs will receive a premium player’s pack, which will include a tournament stamped disc, tournament pint glass, and tournament shirt. As always the FDGC will provide many quality CTPs for each division! Because of the tournament format we are limiting the field to 144 players: 100 spots will be reserved to amateurs and 44 spots for professionals. Get signed up today - spots are going fast. 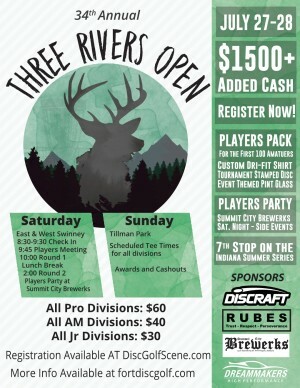 We are excited for this year’s edition of the Three Rivers Open - we hope you can make it. Thanks to some of our largest sponsors Discraft, Dynamic Discs, RUBES, Summit City Brewerks, and DreamMakers High Preformance! Fort Disc Golf Club is responsible for all refunds/cancelations.